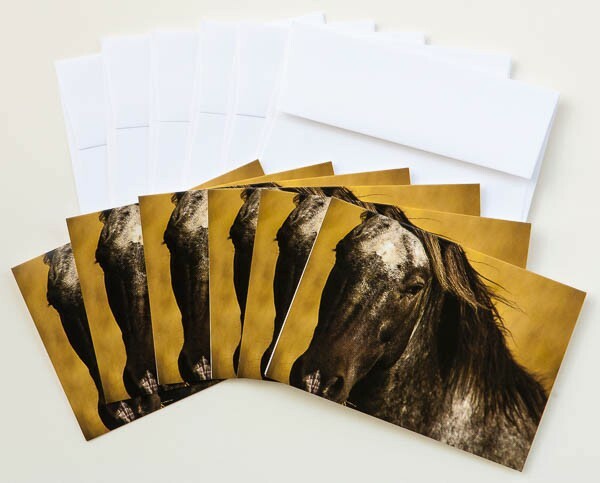 Printed in the U.S.A. on 110# Gloss Coated paper stock, these beautiful note cards will get noticed in a world of emails and instant messages. The image is of a beautiful Appaloosa, a horse breed best known for its colorful spotted coat pattern. This friendly animal lives on a farm in western Idaho. The pack includes six blank note cards. Matching envelopes are included. Cost of shipping will be displayed during checkout. This Shipping Chart shows USPS First Class rates from Seattle, Washington. Note that because I travel frequently to acquire new images, I am not always available to ship an order out immediately. If you need an order by a specific date, please contact me before placing your order to insure that I can meet your deadline. Residents of Washington State will see 9.5% tax added during checkout. 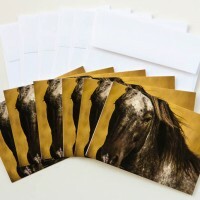 A one year full refund or exchange is offered on undamaged note cards. Note that we cannot reimburse the outgoing or return shipping charges unless the return is due to a defect in quality. Don’t hesitate to contact me if you have a question!